Brittney has been telling people that I know everything about hikes, and someone finally called her bluff, so I'm putting together a list of my favorites. I make no guarantees that my favorites equate to your favorites: choosing which walk to take involves a number of variables, and if junior high taught me anything, it's that I am not like anyone else. This will probably be an awkward post because I am socially awkward and never claim special knowledge of any subject, and if people ask if I know something about something I usually mumble and look down and hope they think I'm autistic and run away. 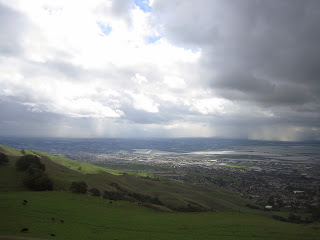 First off, bahiker.com is the best source for bay area hikes. You know it's good because I think the site was first built in 1999. She is the best, and if I could I would funnel all traffic to her. Also, I think she has a book. So once you're done there, you can come back here because I am a poor substitute. This is the best hike in the bay area. It's best done in March while it's super green and preferably during a light rain, because it is basically the same as hiking in the Lake District I promise you I have done 65 miles through it and it is the same. Of course, this is only 2.5 miles ish, but it's basically like climbing stairs the entire way. So, not great for kidlets who are walking. A billion people on warm Saturdays. Not stroller friendly. I mean, you can mostly do it, but you won't like me. Did I say really steep? It's really steep. Not really kid friendly but IT IS WORTH IT. No really, you are basically on a stair master the whole way up. I believe this point here is the most beautiful stretch of trail on the entire peninsula. I'd put it up against any other section in Northern California. There are a few ways to get there: I've taken a couple paths, and Google maps will lead you well, but it's a couple miles in from any put-in point. You can enter via Huddart park if you like; it's usually pretty crowded, and you have to pay. Though there are a billion other trails, so if you have a baby and she/he freaks out, you have options. You can also be cheap and park at Runnymeade and Raymundo in Woodside, then hike up the road or the trail (which then goes to the road), then enter the park at the end of Runnymeade (no pay gates! ), hang a right on Richards, then hang another right on Miramontes (I don't recall it being labeled well). 2 miles out from that route; the miles are pleasant enough, but when you hit the "Miramontes Trail" sign, you've reached Narnia. There's a calm peaceful redwood grove. Almost nobody makes it out that way, because that trail goes nowhere, and I can tell you that because I have bushwacked my way out of it after panicking and realizing that. It's just you, a creek, ferms, and redwoods. It is divine. Awesome hike up and around a little lake, and if you're lucky, you see some turtles. It's about a half mile from the trailhead at Lake Road and Lyall Way, reasonably steep. From there you can circle the lake, or go on further, and probably make a route a few miles long without dying of boredom. Wide trail, and you'll probably see some mountain bikers. All of the suckers park in the main lot for the park, and that is a bad idea. Drive up Edgewood and park at the corner of Edgewood and Canada Road, then take the backdoor trail into the park ("Edgewood Trail" on Google Maps). Find your way to the Ridgeview loop, and keep walking until you see the bay, about 1.2 miles. Super pretty in the winter/spring, and we've seen dear, foxes, owls, you name it. You can extend it as far as you'd like, though most other routes see more elevation gain. We just usually loop back around via the Live oak trail. There's definitely poison oak in them hills! Everyone knows about it, everyone does it, but it's still worth doing. Super pretty paved road along the reservoir. Walk one mile, ten miles, however you like: though I think it's probably a few miles in before it gets really good. If it's a weekday, you can finish off by heading to Pulgas Water Temple, because that is the prettiest structure on the peninsula. Great trails, great in winter/spring, a little ugly in the summer. Way better than trying to beat out all of the millionaire lulu lemon wives for parking across 280 at the dish. Watch out for snakes! DO NOT APPROACH THE NORTHEAST CORNER I REPEAT DO NOT GO ANYWHERE NEAR THERE. I have never smelled anything worse in my life. Easy peasy. Really out of the way, but some good views. There are better hikes further out, but this is about as far as we go these days with a baby. Eh, walk around steep hills. Shady! It's a drive, but super pretty, though quite small. I'm only putting this on here because I know somebody will tell me I "missed the best park ever", but it's only the best park ever because Palo Alto is embittered that no other city on the peninsula would spring for it back in the 50s, so it is closed to non-residents and former residents who no longer have Palo Alto listed on their license. This really belongs up top in the awesome list, but it's too late, I will never finish this post. Start in Sutro baths, and walk along Lands End. You can make it all the way to the Golden Gate bridge, or you can give up and watch crab fishermen at Baker Beach. Either way, it is a magical hike, and the best one in SF. Heaven. We should move there. Start in Vasona park. It's beautiful all year long. Maybe it's called something else? It basically runs along Arastradero above Foothill down to Bol park in Palo Alto (with an alternate branch by a cemetery into Los Altos). Just don't run it in hundred degree weather like I foolishly did back in the day. You might also awkwardly run across a half naked friend and have her pretend she doesn't know you. Come for the acres of trails, stay for the hordes of people on them. Park around Mariner Park, or if you're feeling brave, park illegally at TownePlace Suites Redwood City, and then walk along the gravel path along the bay for as long as your baby doesn't scream. It is...not that pretty. There's also the Feral Cat Highway in Foster City (search for New Park in Foster City) which basically is the same thing, but with more feral cats. I've probably run this trail hundreds of times. Access from whatever point, go for however you like. There are a billion other trails everyone knows about for the rest of the baylands, so you have a large choice of options. If you go a little further to the northwest, there's Shoreline Lake with all of the boats and fun things going on. It's worth a visit. Not much distance in here, but at least it's close to 280 and I think I've only heard of two or three wildfires there during our time here. Forgettable trails, but there's an awesome stable and sort of a museum (it's the old Folger estate), so I bet older kids dig it. Thanks, Chris! I have a bunch of new places to explore now. Supposedly some really great rock climbing in Castle Rock park.